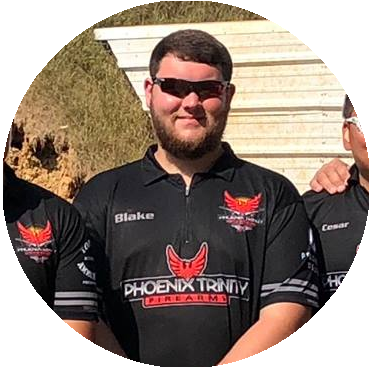 Blake has been a member of Phoenix Trinity since 1998 and has been shooting as a semi-professional sandbagger for a total of 5 years. He’s competed in roughly 200 matches in the Open division. Blake’s favorite competition to shoot in is the Pro Am Shooting Championship which is devised of all steel targets. Blake’s advice for new shooters? “Aim higher.” His favorite gun setup is The Honcho. In his free time, Blake likes to create the best 1911 guns and parts on the market.